"Now let that be a lesson to you Tim, never underestimate the powers of a Martian." Other Stars: Pamela Britton, Ann Marshall, Ina Victor, J. Pat O'Malley, Marlo Thomas, Alan Hale Jr.
Three of the most successful 1960s situation comedies featured ordinary households with extraordinary people living in them. Elizabeth Montgomery would become Bewitched's Samantha, and Barbara Eden the havoc causing genie in I Dream of Jeannie, but the precursor to these series was My Favorite Martian, whose complete 37 episode first season is brought to you by Rhino. Los Angeles Sun newspaper reporter Tim O'Hara (Bill Bixby) is returning from covering an experimental flight when he witnesses the crash landing of an alien spacecraft. Upon discovering the humanoid, but wounded Martian (Ray Walston) inside, Tim brings the being home with him to his rented loft to recuperate. Thinking he has the scoop of the century, Tim is all set to write up his Pullitzer prize expose, but is soon convinced that no one would believe his story, and agrees to keep the Martian's existence a secret. It isn't long before Tim's doting and nosey landlady, Mrs. Laura Lee Brown (Pamela Britton), arrives on the scene and is introduced to Tim's new "Uncle" Martin. With Martin's spaceship out of commission and hidden in the garage, where he is covertly repairing it, the O'Haras have to maintain the appearance of normalcy, but living with a Martian proves to be a bit of a challenge. For starters, Uncle Martin has a few unusual traits�he has a pair of retractable antennae and a habit of disappearing, he can levitate objects simply by pointing at them, he has the ability to read minds, and can talk to animals. While Uncle Martin is able to conceal his powers most of the time, there are circumstances where his system runs amok, such as when he has a cold or during electrical storms. To put it simply, this show is hilarious, even though the basic premise and gags remain fairly constant throughout. The chemistry between Walston�who I can recall getting him mixed up with Lost in Space's Jonathan Harris, an apparently common mistake�and Bixby is brilliant, with Martin's smug character playing perfectly against Bixby's often befuddled demeanor. Uncle Martin is a fish out of water, trying to adapt to the strange behaviors and customs of his new home after being stranded. This isn't his first visit to Earth, however�he's been coming for centuries (adding another layer to the comedy with references to all the historical events he has been party to). But he seems more confused than ever about how humans think and interact with each other. The interplay between Tim and Uncle Martin isn't just limited to comedy, as the series does a good job of establishing their friendship, and the tenable feelings when Martin seems on the brink of returning home. It is this dimensional characterization that adds immensely to the viewer's attachment to the characters. While keeping Martin's true identity is pivotal in the stories, the writers play different angles, working in the reactions Martin's idiosyncracies produce. Even when Martin admits he's a Martian, the announcement isn't always received as expected, and the dialogues between Martin and government agents, psychiatrists, or UFO buffs take some pretty comedic turns. The writing is pretty even, making it difficult to pick out favorite episodes from the season, but among the highlights are How to be a Hero without Really Trying, where Martin tries to make Tim look good in the eyes of a new neighbor (who had originally been slated as Tim's steady girlfriend, before the idea was dropped), My Nephew the Artist, where Uncle Martin's artwork raises more attention than he cares for, leaving Tim to take the credit. Rocket to Mars has the O'Haras enlisting help from the canine contingent when Martin's spaceship is sold to a junk dealer, and Martin and the Eternal Triangle finds Martin trying to deflect the attentions of a new man in Mrs. Brown's life. On the guest front, Gilligan's Island's Alan Hale Jr. appears as a tycoon set to launch his own ship to Mars, with Uncle Martin as its captain in The Disastro-nauts, and That Girl, Marlo Thomas appears as Paula, Mrs. Brown's inquisitive niece, in Miss Jekyll and Hyde. The series was executive produced by veteran Jack Chertok, who discovered the screenplay for the pilot, which he was told had been rejected by every producer who had seen it. CBS bought the show based on the pilot, and ordered thirteen episodes produced, but quickly realised they had a problem on their hands with the new scripts, and brought in Sherwood Schwartz (creator of Gilligan's Island and The Brady Bunch) as a script supervisor. Schwartz recognized that the new scripts had shifted the focus of the show away from the Martian, and revised what could be salvaged while tossing the remainder. Astute viewers will note a few inconsistencies, such as the layout of Tim's house, where the fireplace changes location, due to changing the sound stage where the show was filmed on the Desilu lot. A product of its time, it is interesting to note some of the cultural differences that have occurred since the show aired. To start with, Tim's character is your basic cad, with a new romantic interest almost every week, something that wouldn't wash in the modern era, especially for a family show. The 1960s preoccupation with Communism and the Cold War plays a part in Russians R in Season and If You Can't Lick Them, where Martin's antennae become the latest kid's fad, demonstrates a startling difference in child safety standards. 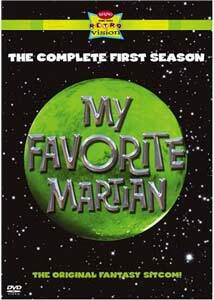 Unlike many shows which have great nostalgic appeal, but disappoint when revisited now, My Favorite Martian still packs all the fun it did when I was a kid, albeit with the more mature overtones evident. Image Transfer Review: The black & white image quality is quite good overall, but there are some video transfer induced artifacts present. Greyscale is rendered well with even midtones, solid blacks and highlights which aren't blown out. While not overly sharp, detail is well defined, but is subject to cross coloration, which mainly affects patterned areas such as plaid jackets. There is some aliasing present, as well as some minor video tape dropouts in places, a moderate amount of minor print damage and a bit of ringing in high contrast areas. Grain is not overly abundant. There is room for improvement here, but only if the original source material is still salvageable. Audio Transfer Review: Mono audio is clear, and dialogue is easily discernable, but there is a fair amount of excess sibilance, which I suspect is in the source. No dropouts were detected, and distortion and hiss are negligible. There is nothing that I wouldn't expect from a forty-year-old television production. Extras Review: There are no additional extras, however kudos have to go out to Rhino for locating a complete version of the pilot episode, which had, until very recently, been considered lost. Each episode has four chapter stops, including one immediately following the opening credits for those who wish to skip them. The packaging utilises a distinctive reflective foil, and the insert lists the episodes on each disc with their original air dates. I have fond memories of this show from when I was a kid, and it has lost nothing in the intervening years. My Favorite Martian is a highly entertaining series that manages to deliver with the exceptional chemistry between its principles, despite relying on a limited range of plot devices. Fun for the whole family, I can't wait for more! Highly recommended.